Consider: what does Christmas mean? It means, of course, the mass of Christ, the celebration of the birth of a Palestinian prophet named Yeshua, or Jesus. But what exactly does that mean? Historians have no idea what time of year Yeshua was actually born. The early Christian church celebrated his birthday in April at first, and then in June for a while, before settling on a strategy of co-opting yule and solstice. The first December Christmas wasn't celebrated until around 380 CE. In the last 200 years, Christmas has been radically transformed -- and Unitarians were at the forefront in most of the transforming. Christmas now means we put a tree indoors, and we decorate it. It was a practice in Germany, brought to the United States in the early 1800s by Charles Follen. Charles Follen was a Unitarian. Christmas means dashing through the snow, one-horse open sleighs. It means bells that jingle, and it means laughing, all the way. That’s the song “Jingle Bells,” by the James Pierpont. James Pierpont was a Unitarian. Christmas means music. In addition to "Jingle Bells," other Christmas songs include "I Heard the Bells on Christmas Day” by Henry Wadsworth Longfellow, "Watchman Tell Us of the Night," by John Bowring, and "Do You Hear What I Hear?" by Noel Regney. Henry Wadsworth Longgellow, John Bowring, and Noel Regney were all Unitarians. Additionally, "It Came Upon a Midnight Clear," is by a Unitarian minister. More about that one later. Christmas means Old Ebenezeer Scrooge’s heart opens up to compassion and joy. Charles Dickens, in 1843, published A Christmas Carol, and Christmas has never been the same. Charles Dickens was a Unitarian. 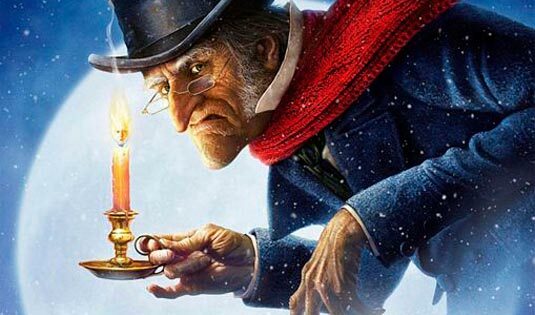 In Dickens' tale, Scrooge confronts his past, when as a young man, his need for money -- that is, we suppose, his need for security or status -- caused him to lose his fiancee, Belle. He is shown the present reality of joy in gatherings of families, whether they are poor like Bob Cratchit's or relatively well off like Scrooge's nephew Fred. Then he is brought to an awareness of his own impending death. It's not that Scrooge had explicitly believed himself immortal. It's just that he had pushed the fact that life is temporary out of his mind. In pushing away death, he had pushed away life, for the two are the same. "writing all manner of letters about their homes and hearths, and how the Carol is read aloud there, and kept on a very little shelf by itself." A Christmas Carol remains the most widely read-aloud book. It is still theatrically performed in various venues around the country every year. It has been made into numerous movie versions. Other popular Christmas tales such as It's a Wonderful Life and How the Grinch Stole Christmas are but re-workings of Charles Dickens' Unitarian gospel. "According to historian Ronald Hutton, the current state of observance of Christmas is largely the result of a mid-Victorian revival of the holiday spearheaded by A Christmas Carol." The Christmas gospel of generosity, gratitude, and the joy of family gathering is fundamentally Unitarian. The Christmas social gospel is also Unitarian. Christmas means the message of Peace on Earth, to all goodwill. In 1849, just a few years after Dickens wrote A Christmas Carol, a Unitarian minister, Edmund Hamilton Sears, wrote the words to "It Came Upon the Midnight Clear." With the war in Europe and the US war with Mexico weighing on his mind, Rev. Sears wrote a carol that urges us to hear the angels sing of peace on earth, to all goodwill. The Gospel of Luke tells of angels proclaiming Peace on Earth -- but for most of the history of Christendom, that has been taken as referring to a private, personal peace. Few imagined that peace on earth actually meant we should stop killing each other. Rev. Edmund Hamilton Sears, however, was at the vanguard of a movement to understand peace on earth in social, community terms – instead of merely a personal, private peace. He called us to task for not heeding the angelic call to peace. and man at war with man hears not the love song which they bring,"
and the whole world give back the song which now the angels sing."